Shoulder replacement surgery describes a procedure where the damaged parts of the shoulder joint are removed and replaced with new synthetic materials (prosthesis). Also called shoulder arthroplasty, this procedure is typically used to treat severe arthritis where the prominent feature is pain. Shoulder replacement surgery may involve just replacing the ball – the head of the humerus – or both the ball and socket (the glenoid cavity). The decision to have this treatment should be made after an assessment and discussion with your orthopaedic surgeon. The decision will always be yours to make and you need to carefully consider all the information you have received during the consultation, including what the expected benefits are, what the risks are and what the alternatives are. Shoulder replacement may be performed under general anaesthetic or regional anaesthetic or a combination of both. There are several different techniques, but the general procedure involves making a cut at the front of your shoulder and removing either just the ball or the ball and the socket. The new ball is typically made of metal, while the socket is usually a type of plastic. The prosthesis is fitted tightly into the bone and anchored into place with bone cement. After the incisions are closed and a wound dressing placed, you will be fitted with a polysling and body belt. What is reverse shoulder replacement? Reverse shoulder replacement describes a procedure where the damaged parts of a shoulder joint are removed and replaced with new synthetic materials (prosthesis). Instead of replacing the socket with plastic and the ball with metal, the ball is replaced with a plastic cup and the socket is replaced with a metal ball. After your shoulder is cleaned and prepared for surgery, your surgeon makes a cut at the front or the top of your shoulder and moves soft tissue aside to expose the shoulder joint. The top of the scapula and the ball of the humerus are cut and the shoulder joint is removed. A new ball is attached to the scapula and a cup on rod is inserted into the shaft of the humerus.The prosthesesare anchored into place with bone cement. Immediately after surgery you will start therapy consisting of finger, wrist and elbow movements. The body belt is removed and therapy continues with further exercises (pendular exercises, scapular setting, passive flexion, external rotation). You will also be taught how to keep your armpit clean. Most people are discharged on day 1 or 2 after surgery back onto the Gold Coast. Your rehabilitation therapy program will continue as follows. By the end of week 3, you should have 50% of the range of motion you had before surgery. If you have an office type job, you may be able to return to work. By the end of week 6, your passive range of motion should be as least as good as it was before surgery. Most people can resume driving at this stage, as week gentle activities such as breast stroke. By 12 weeks, your active range of motion should be as least as good as it was before surgery. You can also start swimming freestyle and lifting objects. Your surgeon will advise you if you’re able to return to manual work at this stage. 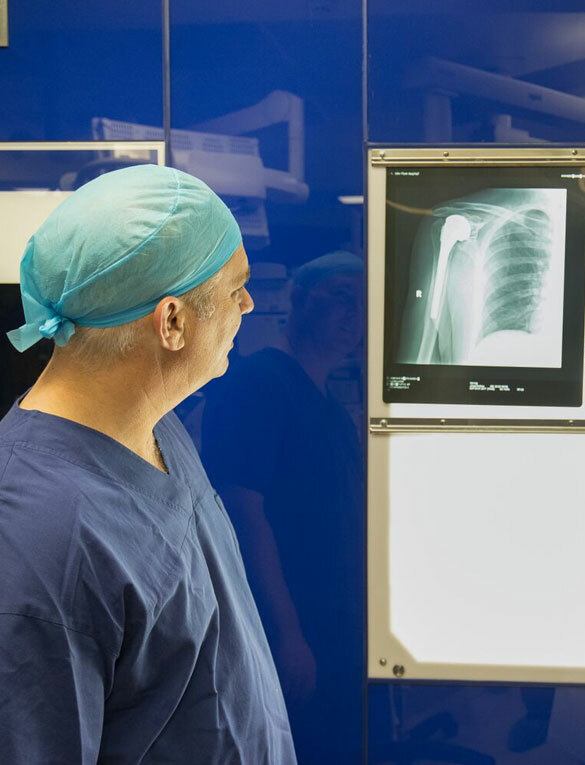 Our specialist surgeons offer treatments for a range of conditions, as well as offering care and treatment for shoulder replacement surgery. 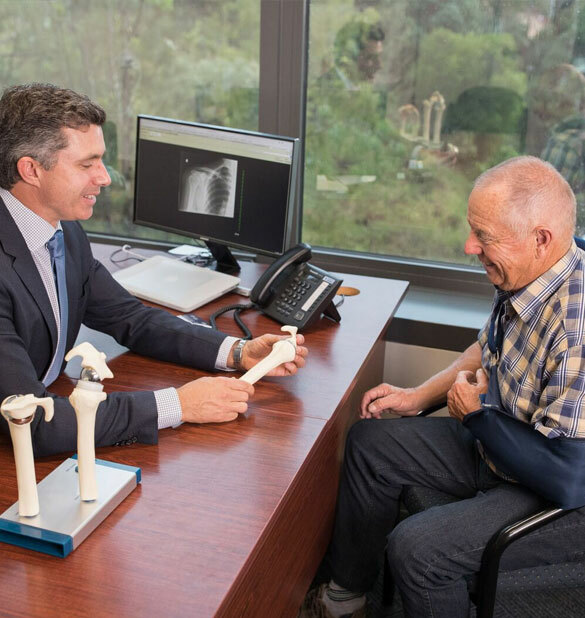 At Orthopaedic Clinics Gold Coast we also provide total hip replacements, ACL reconstruction, ankle ligament reconstruction, arthritis surgery, knee preservation surgery, meniscus repair and much more. To discuss your treatment options, or to book a consultation, please call us on 1300 399 223.